Las Vegas TruckVault recognizes that vehicle equipment storage is an ever increasing challenge among the public safety community. Due to the enormous amount of weapons and gear you must carry, organization, security and functionality is a must. 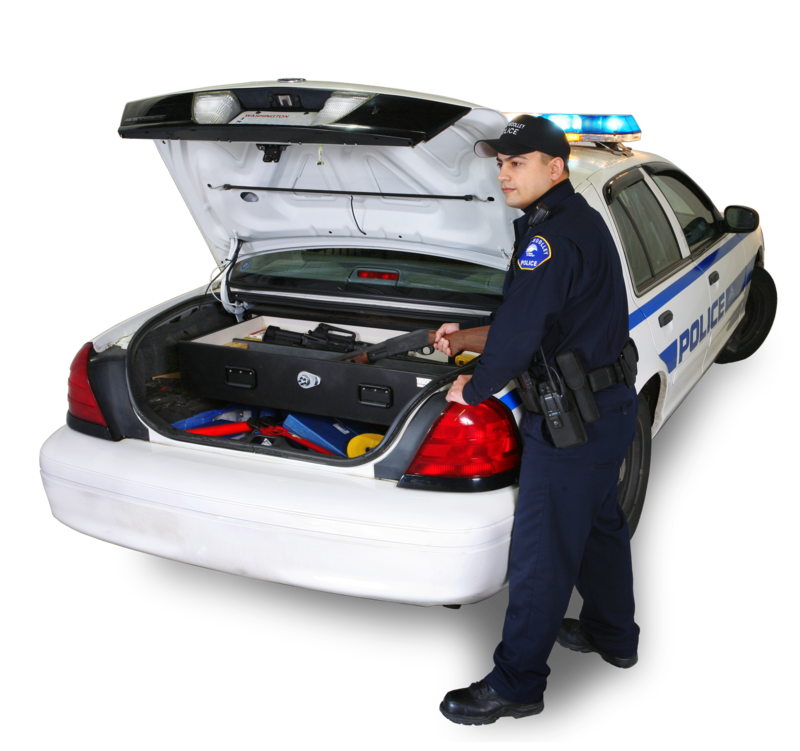 That is why we teamed up with countless Public Safety professionals to develop a complete line of secure storage solutions that meet your team’s specific needs and maximize your vehicle's cargo efficiency. From ConsoleVault's to BedVaults, we cover it all. 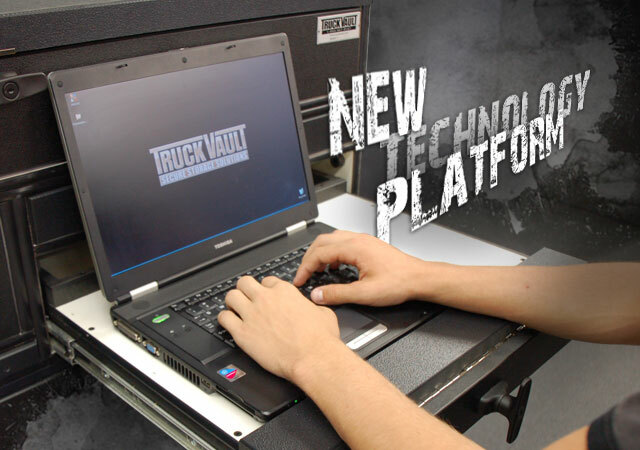 Whether you are a Law Enforcement Professional, Fire Fighter, EMT, Government Agent or Special Teams Operator, TruckVault has the answer for you, guaranteed. 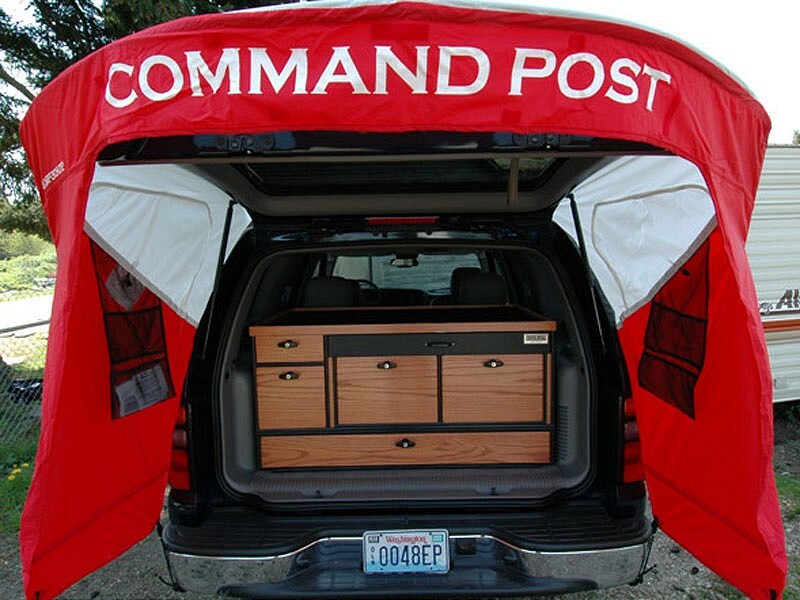 We manufacture the world’s finest command centers, trunk organizers, SUV storage cabinets, lock-up boxes, gun safes and pick-up cargo carriers. If you cannot find the exact product you are looking for, contact us - we will build a custom unit to your specifications. Over the last ten years, thousands of sports enthusiasts across America have discovered what an invaluable product a TruckVault really is. Whether your passion is hunting, fishing, clay shooting, photography, scuba diving, archery, or collectables, TruckVault has the right secure storage solution for you. Hallmarked by our superior American craftsmanship and a handsome oak finish, TruckVault’s sports line offers you the organization and protection that you deserve for all of your equipment. 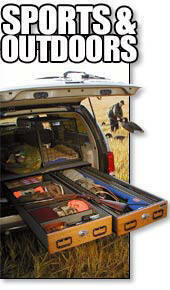 Long guns, rods, decoys, ammo, snow shoes, cameras, whatever it is that you carry with you throughout your journeys, a TruckVault keeps it safe and secure - guaranteed. TruckVault is proud to announce the launch of a new product line, designed and constructed specifically for Land Surveyors and Engineers. 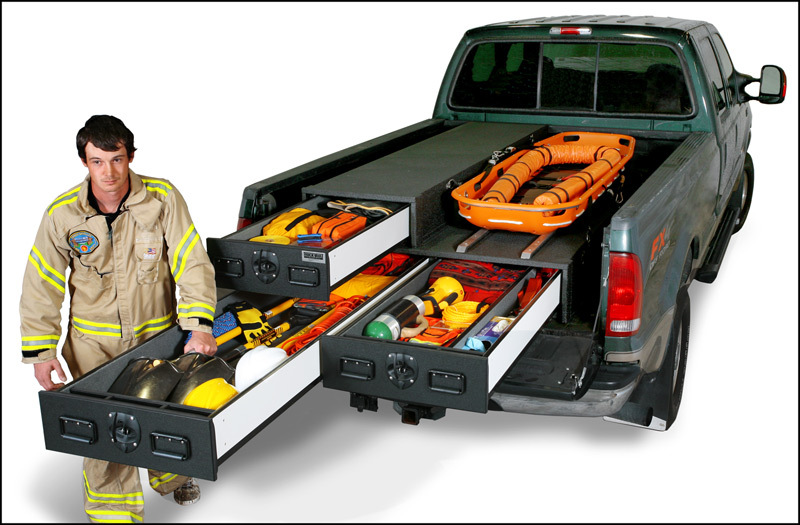 TruckVault Surveyor in-vehicle storage systems organize and protect sensitive equipment better than any other product on the market by offering the best construction, strongest materials, most options and we are the only manufacturer in the industry to offer a lifetime warranty. 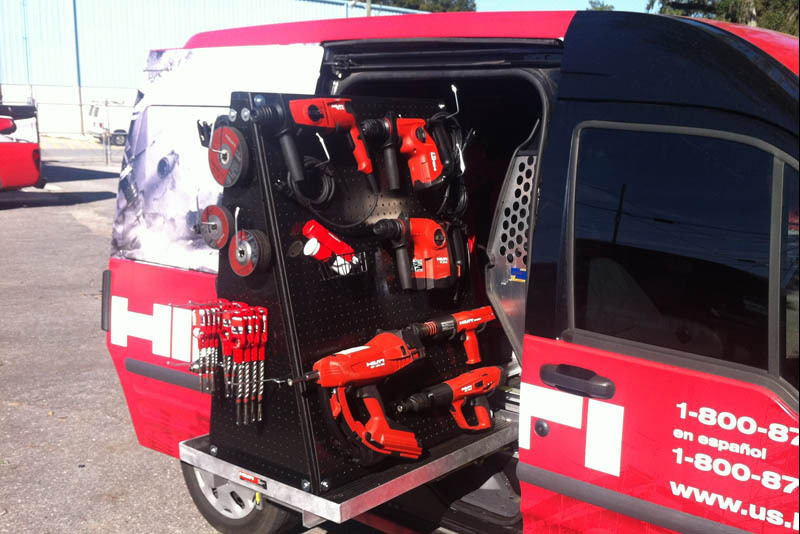 From your most expensive instrument to your shovels, tripod and manhole cover pick, TruckVault provides the best choice in secure in-vehicle storage. Regardless of your business expertise - professional surveying, aerial surveying, GPS mapping, digital mapping, or working with the NGA – you will find TruckVault products meet your needs. TruckVault’s unique materials actively prevent condensation and moisture to protect sensitive GPS, Total Stations, Transit Levels and TWP surveying equipment from serious, irreparable harm. 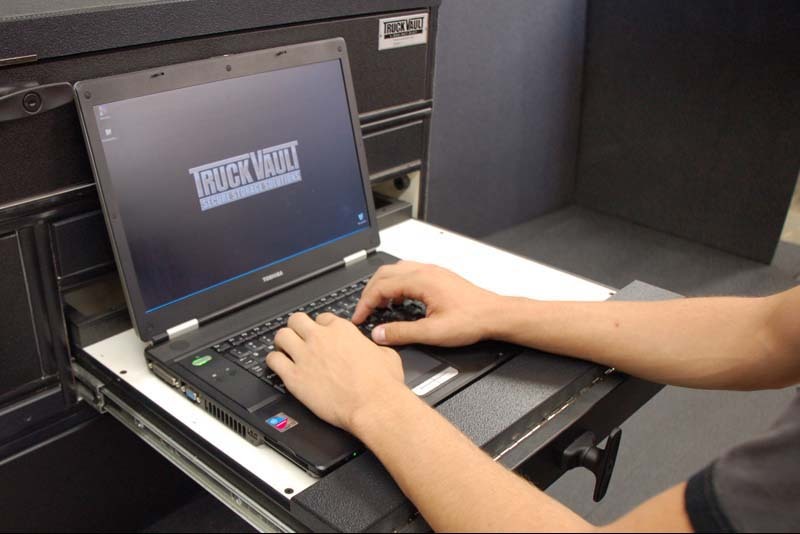 TruckVault has served the rigorous demands of law enforcement and government agencies for over 10 years. All package TruckVault products feature exclusive push-button locks with a key over-ride, and are backed by over a decade of award-winning, field-tested performance. 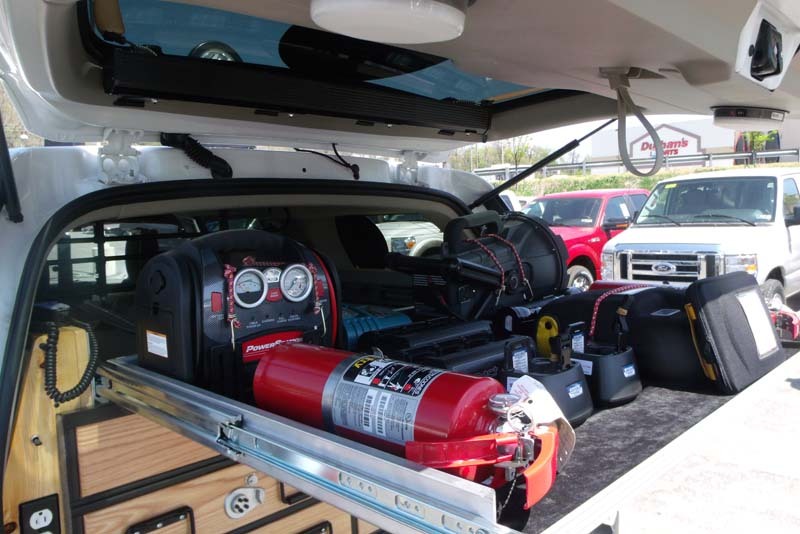 TruckVault in-vehicle storage solutions have proven themselves as the leader in fire protection. 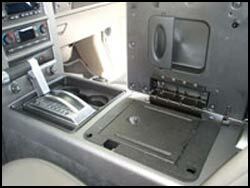 Steel and aluminum units transfer and trap heat inside the cargo area, while plastic simply melts away. 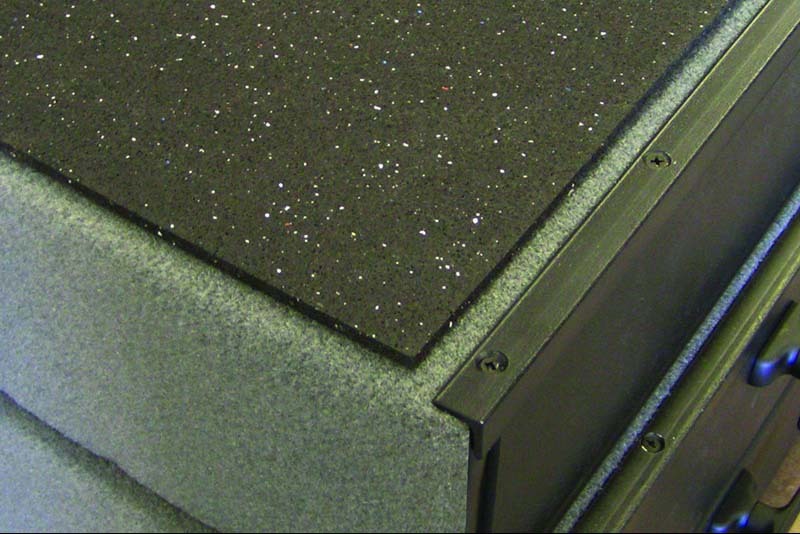 TruckVault’s products insulate sensitive equipment from the heat, shielding them from damage. TruckVault Land Surveyor and Engineer Systems will serve you, fully guaranteed, for as long as you own the vehicle it is in. That’s the TruckVault Promise. TruckVault has worked closely with local surveyors to come up with the best solutions for on-site organization, storage and transportation of all of your gear, and is happy to work with you to help design a new product to match your needs. 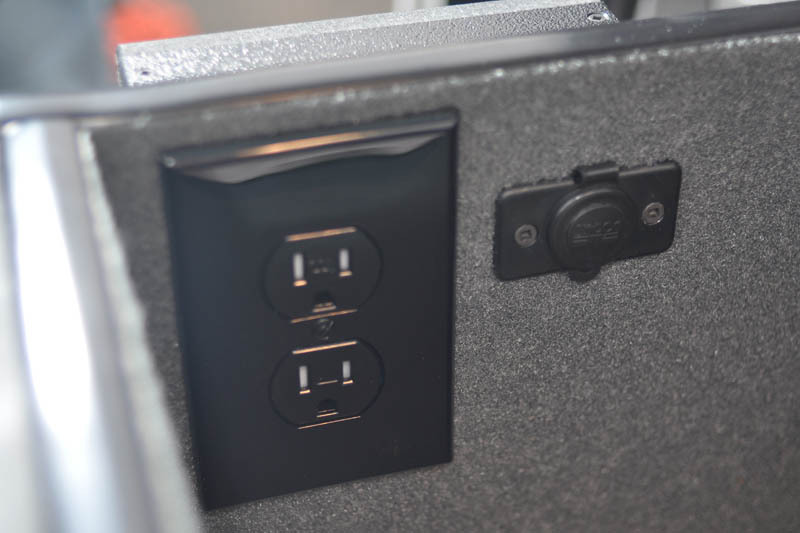 With a wide range of base products, from compact units for smaller SUVs to the full-featured capabilities of the Field Office Command Center, TruckVault will allow you to maximize your effectiveness on the job by keeping your tools right at hand, safe, secure and fully organized. Below is a listing of a few of the products pre-designed for surveyors and engineers. Again, if you do not see something that would meet your needs exactly, please let us know and we can work with you to create a product to fit your specifications. 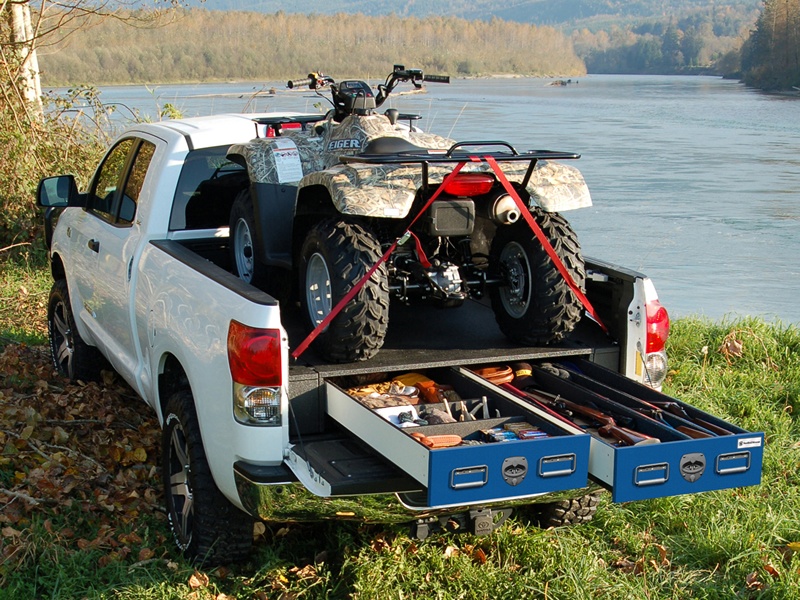 Originally designed for Chevrolet Silverado's and easily adapted to any other pickup on the road, the Pickup Surveyor TruckVault multiplies the storage capacity and function of your truck exponentially. Full-length drawers in both Standard Height (5.625" clearance) and Magnum Height (10.5" clearance) with open-faced shelves along the bottom for spades, stakes and other frequently used, or frequently dirty, tools. This product provides ample storage for all of your equipment including Rods, Theodolites, Transit Levels, Poles, Levels, Magnetic Locators and Tripods. 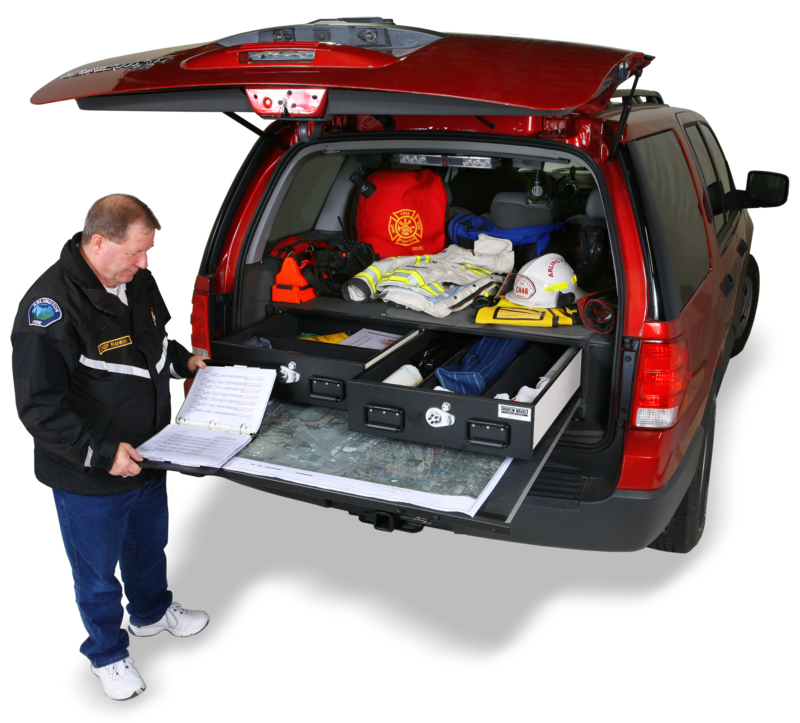 Built for smaller SUVs, such as the Chevrolet Tahoe and other compacts, the one-drawer and two-drawer Surveyor TruckVault is designed to organize your equipment securely. 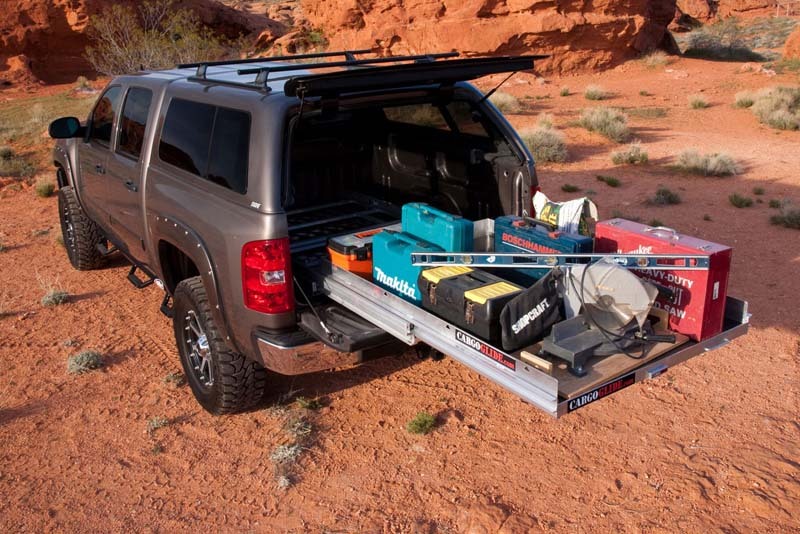 With an extra-deep top drawer (approximately 10.5" of internal clearance) and three 8" tall open-faced shelves, this model is ideal for surveyors with smaller vehicles. This model will keep your most sensitive equipment safe and secure including Prisms and Targets, Total Stations, Magnetic Locators, Laser Levels and Tribrachs. 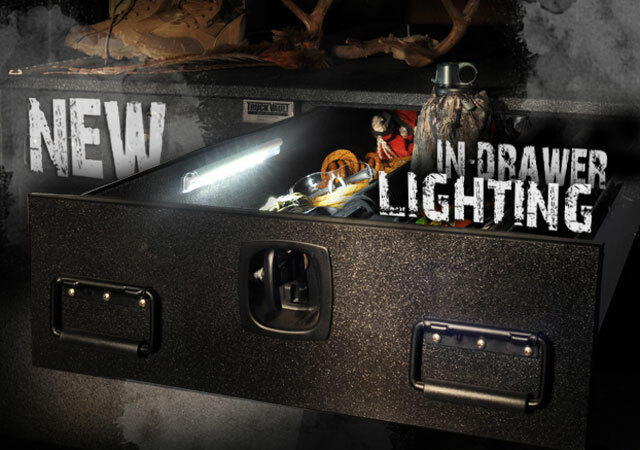 Designed similar to the above single-drawer model, the two-drawer Surveyor TruckVault features stacked shorter drawers, ideal for site maps, compact tripods, laser sights and the rest of your gear. The two top drawers offer 4.25" of internal clearance, while the bottom open-faced shelves are 8" tall for bulkier gear. 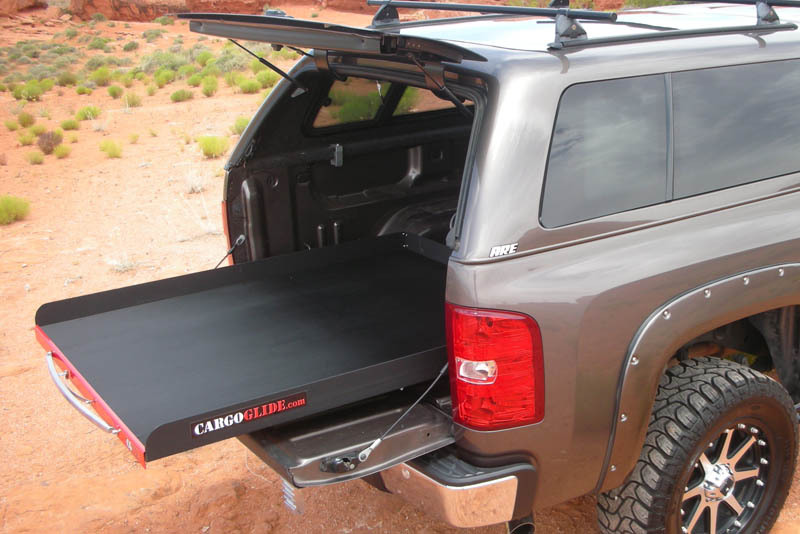 Designed for Chevy Suburban, Yukon XL and similar full-length SUVs, this unit provides open cargo storage for tools and long stakes in the bottom with magnum-depth drawers in the middle row for bulky equipment and standard-height drawers along the top for the rest of your gear. 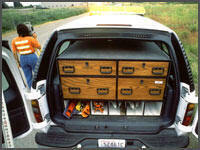 The length of this vault is dependant on the vehicle, but typically exceeds 60". 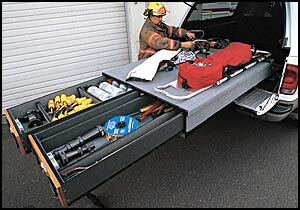 This provides enough room to transport long tools including Tripods, Leveling Rods and Poles. 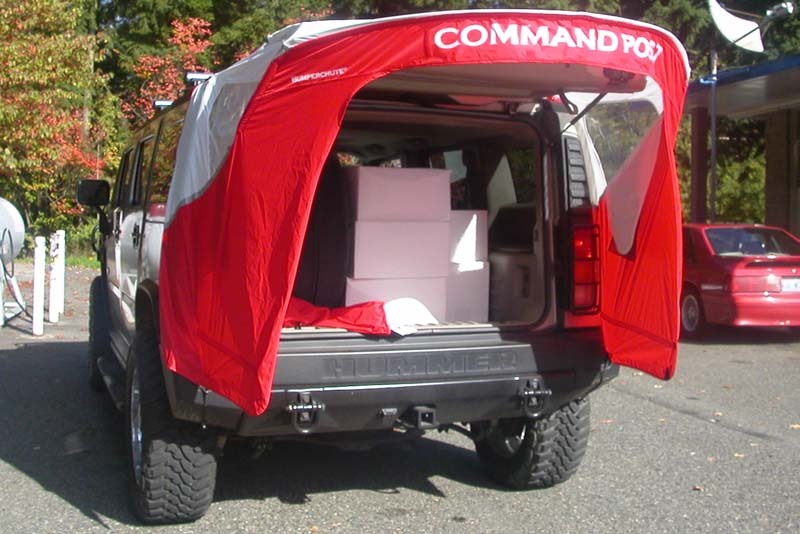 The fully-featured Field Office Command Center was designed specifically for busy surveyors and engineering professionals, creating all of the functionality of the office in the back of a full-sized SUV. 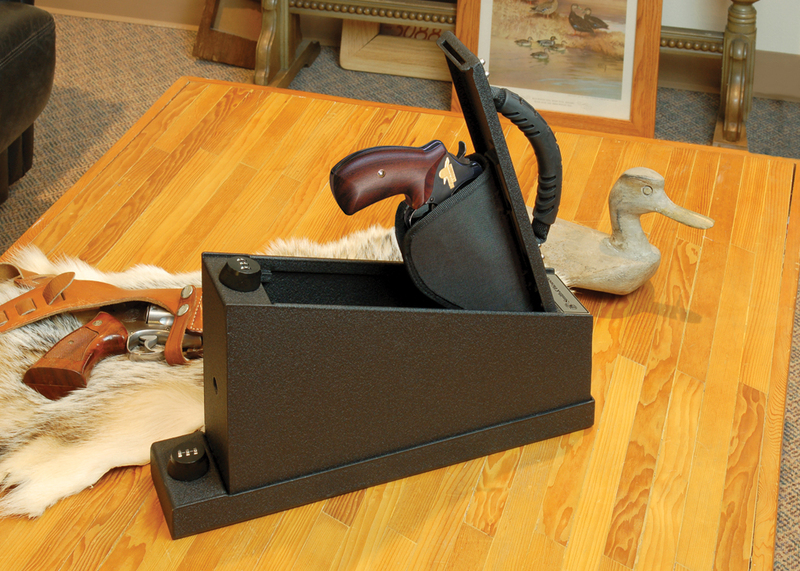 From the back doors, the Field Office provides a full-length magnum-depth (10.5" clearance) drawer and two open-faced shelves, a broad open shelf for temporary storage, and a huge storage box with a drop-down door faced with magnetic white board. Internally, the Field Office provides a full-sized pull-out drawing desk, padded recess for a printer, open-faced shelves for extra paper and other supplies, wide fold-up map board for site plans, and a letter-sized hanging file drawer with partition for binders and other supplies. The desk folds up and slips back into the command center, allowing you full access to your cargo area behind the front row seats. 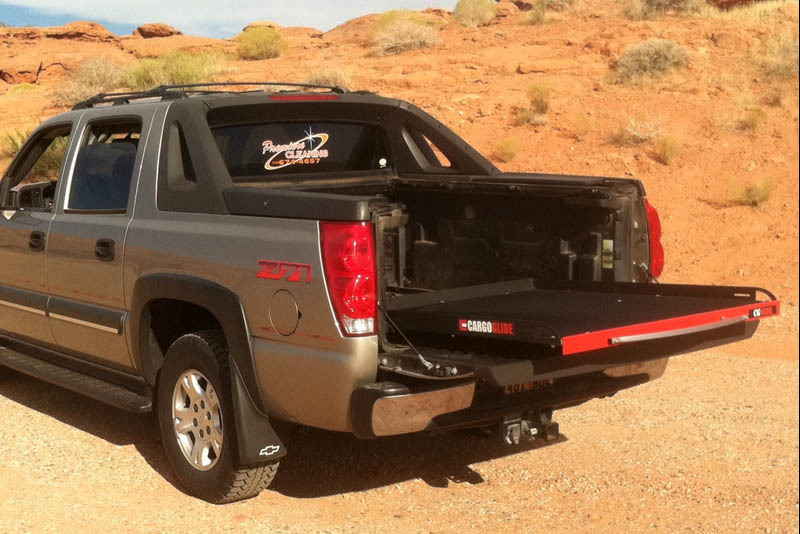 With a CargoGlide bed slide, you can stop crawling in the back of your truck or van every time you need to reach your gear. So stop scuffing your knees and breaking your back! 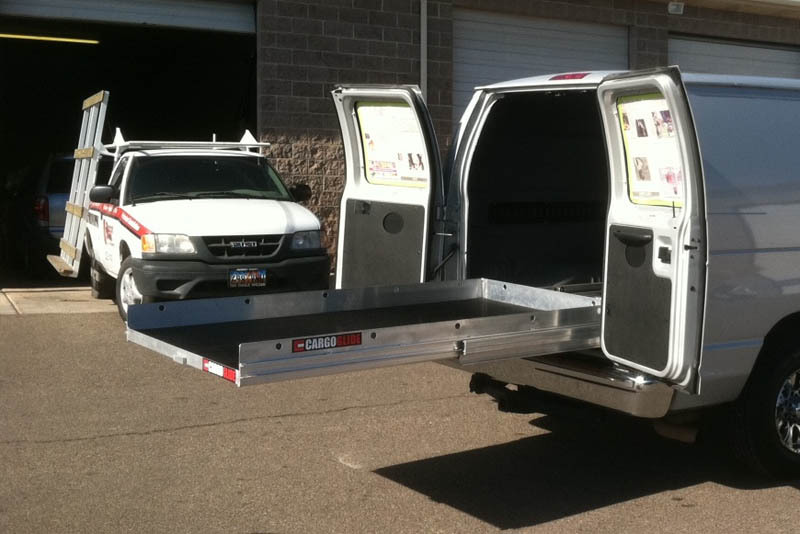 Install a CargoGlide in your truck or van and get your gear and materials out when and where you need them! 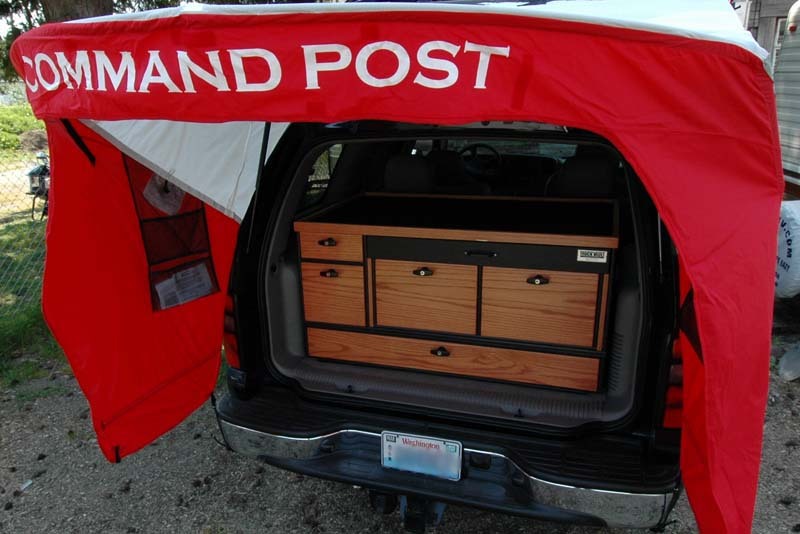 CargoGlide, is a great way to get your gear, materials or products from the back of a truck, van, work truck or SUV. 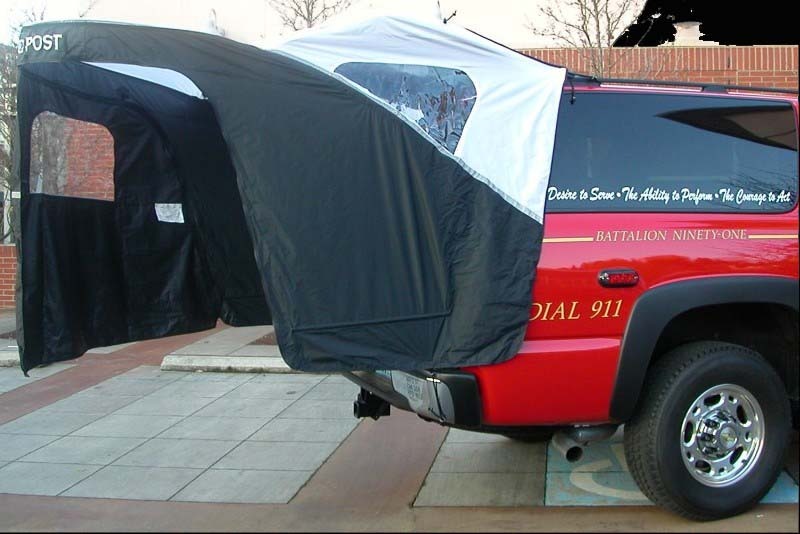 Just squeeze the heavy duty handle and slide your gear out of the bed of trucks, vans or SUVs! For light duty truck, van, SUV and light commercial use. Comes in stock sizes for all pickup, van and SUV applications. Capacities of 1000lbs and 1500 lbs, evenly distributed. 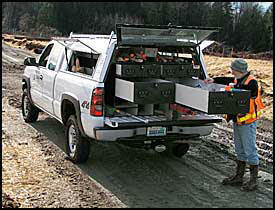 CargoGlide has built a model just for these trucks, comes pre-assembled, perfect fit, cool looks, NO DRILL installation. The best bed slide out for the Avalanche and Cadillac EXT. Best value on the market! for medium and heavy duty applications in trucks, work trucks and vans, comes in stock and custom sizes, made of aluminum, 70% extension, very smooth operation, designed for high use situations! Capacities up to 2500lbs. For medium and heavy duty applications, this bed slide offers, 100% extension, solid construction, easy smooth operation with 16 bearings, 4″ side rails, pre-assembled, easy install and it simply does the job! 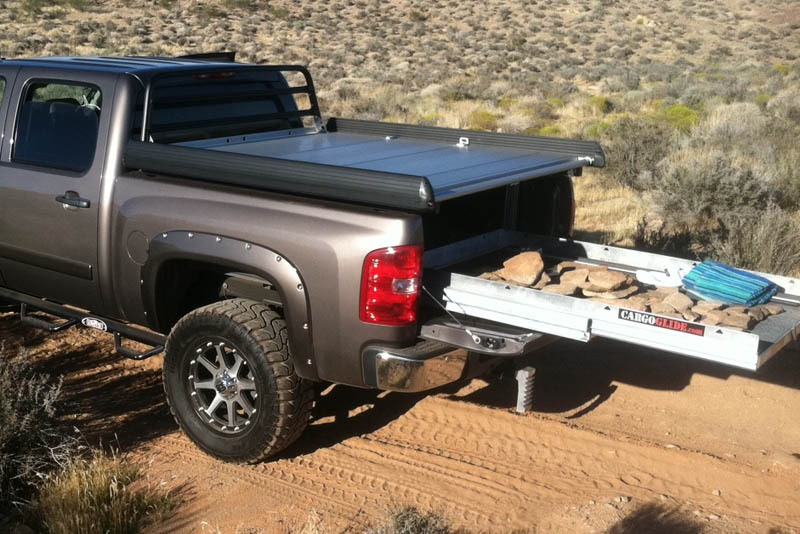 if you want the BEST cargo slide, bed extender on the market with stock and full customs sizes and capacities up to 2500lbs, you have come to the right place! *Prices listed do not include tax (if applicable) or shipping. As any First Responder knows, setting up a Command Post quickly is critical to the success of the operation. 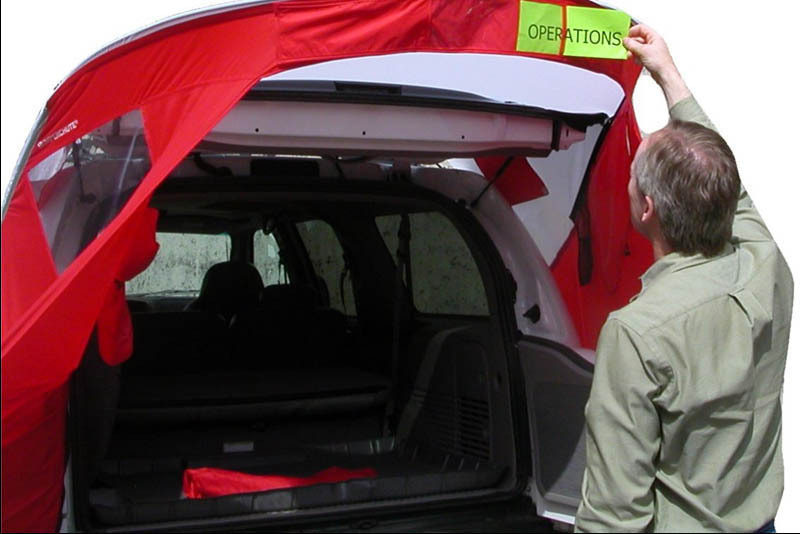 The Bumperchute is so easy to install* that the Incident Commander can do it alone. 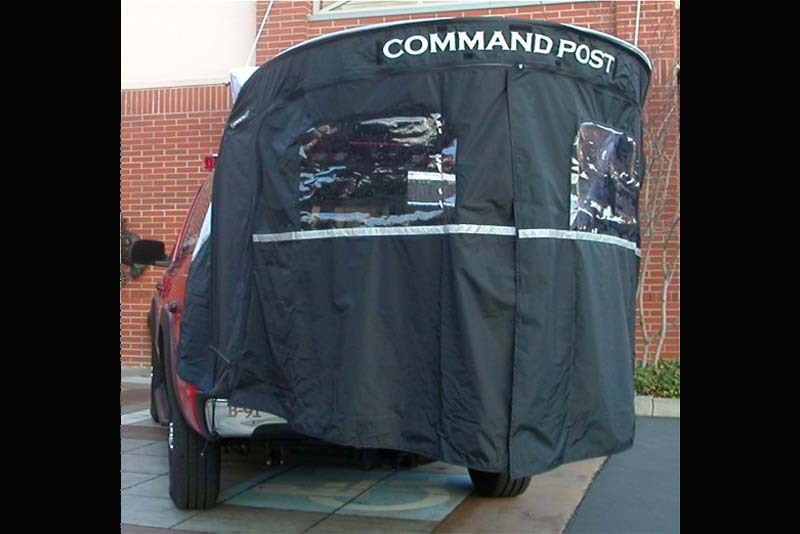 In less than two minutes, the canopy provides a secure work environment and glare reduction to make electronic data easier to read. Bumperchute extends almost three feet beyond the opened lift gate providing you that additional much needed overhead protection. Side panel windows have interior flaps which can be open for visibility or closed for shade. 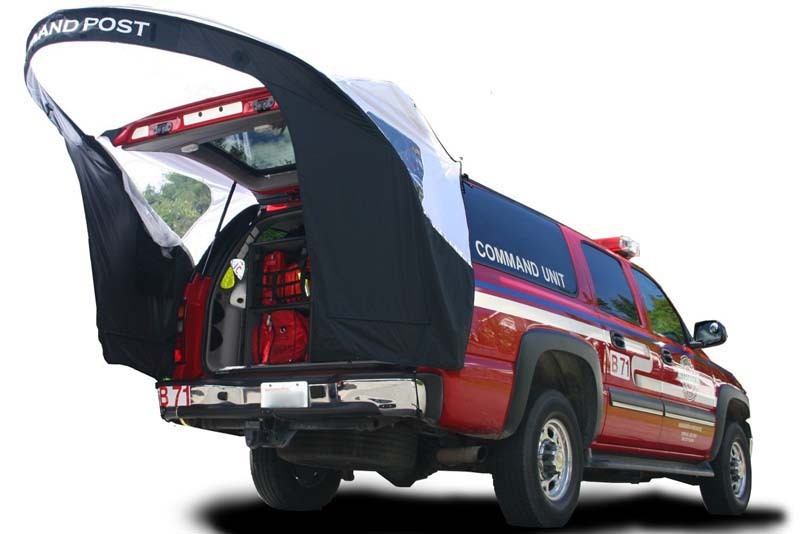 Side panel has 3M Scotchlite™ Reflective trim which increases nighttime visibility. Overhead coverage extends almost three feet beyond the opened liftgate to provide additional overhead protection. Provides shade and shelter. Decreases work space glare. No guy lines or anchor weights to trip over. Compact and easy to stow. Entire set-up stuffs into a 26” bag. Side panel windows have interior flaps which can be open for visibility or closed for shade. Brow has Velcro sewn on. Handy built-in instructions. *Requires the factory roof rack for this product to work. 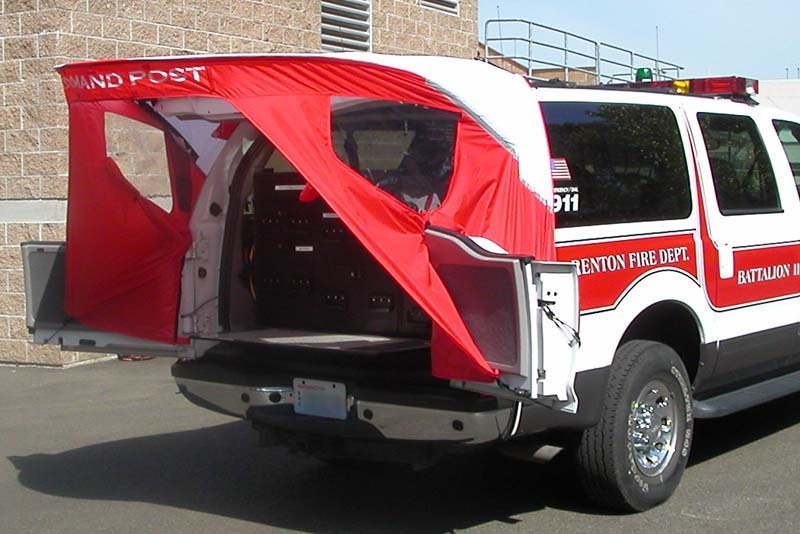 The cargo restraint tie-down rail system design allows for secure tie-down of cargo in an instant. With a vertical pull strength of up to 7,000 lbs., our tie-down rails can help to reduce damage and loss of equipment. Similar products to this have been selected as an integration solution for multiple U.S. Army and Marine Corps C4ISR programs and is currently installed on thousands of military vehicles, providing secure restraint to sensitive communications and similar equipment. Featuring simple installation and instant removal or repositioning of tie-down rings, tie-down rail systems are the fastest, strongest secure cargo restraint system we've ever encountered. The 100% recycled rubber TruckMat's are specially designed and manufactured for durability. The flexible, TruckMat is manufactured in the USA by recycling scrap tires! With it's easy to clean surface and excellent traction - even when wet, the TruckMat adds extra protection for both your covered and uncovered TruckVault. 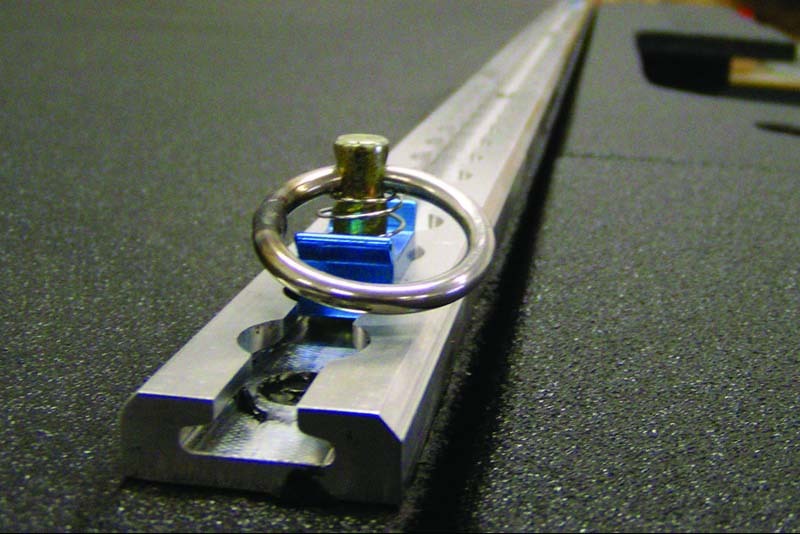 The TruckMat is sold in widths of 45" and cut to the length of your TruckVault by the linear foot. The TruckVault Technology Platform (TTP) is designed to provide power and lighting where you need it, when you need it, for as long as you need it. Cubbies and Table Extensions for Laptops and other portable gear. Heavy duty wiring and state of the art cable handling ensure years of dependable service. 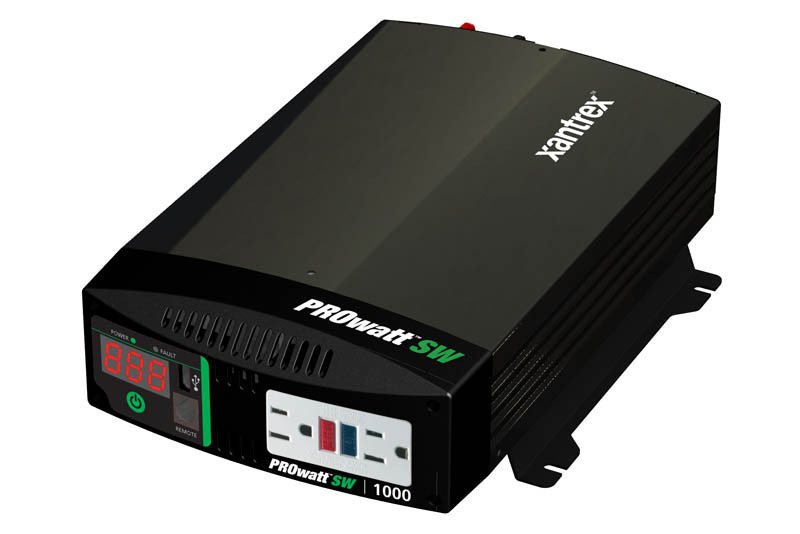 TTP Power Systems have a 1-year warranty from the date of purchase. Additional warranty coverage is available from the original manufacturer on some components. P-566 12v In Drawer TTP - Narrow Drawer 3"
Note 1 Inverter (P-571 or P-575) Required. 3" are removed from the drawer to accommodate the cable management system. 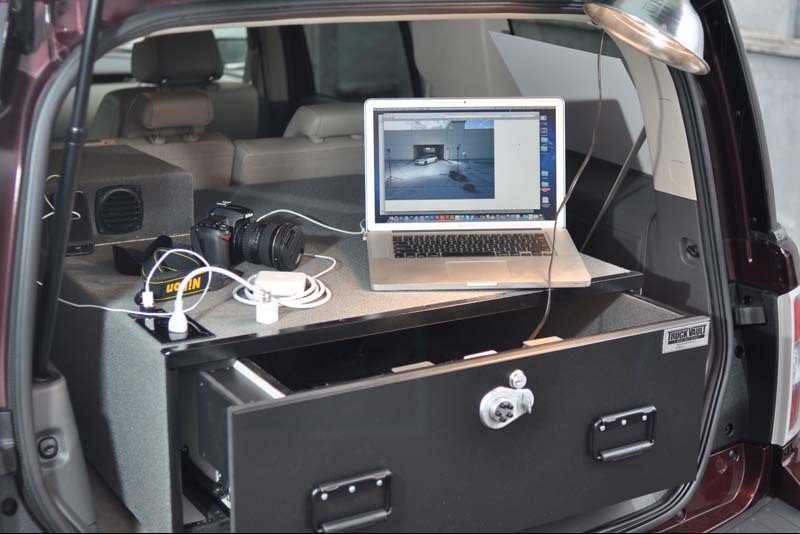 The first drawer cubby is more expensive because they have all the supporting hardware and wiring required to integrate with your vehicle. - A cubby is a storage space without a drawer. To order or for more information, call (702) 630-SAFE (7233) or Click Here to email. For an Online Quote, specific to your Vehicle, please Click Here or click the image on the left. Las Vegas TruckVault is pleased to present the new line of Smith & Wesson branded products, which is recognized globally as a leader in the areas of Safety, Security, Protection, and Sport. 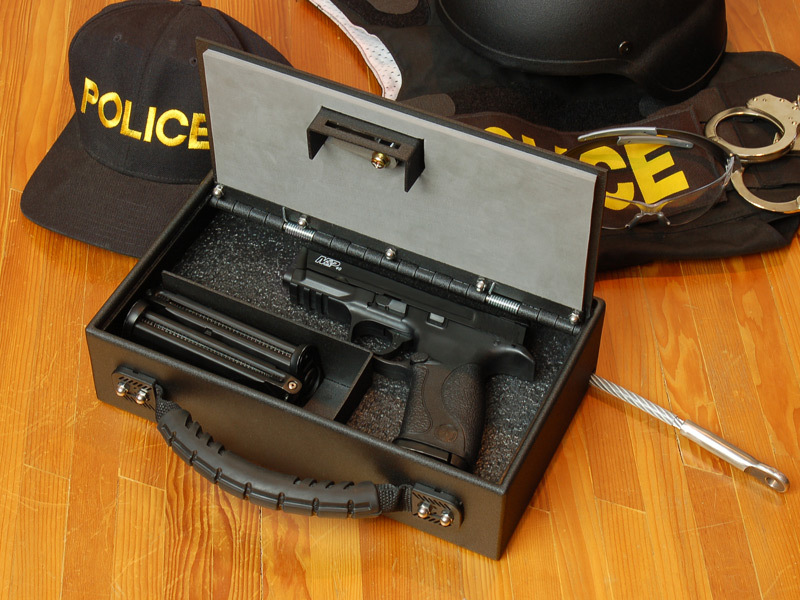 These high security safes and in-vehicle storage systems offer secure storage for both the Public Safety sector and for the Sporting Goods Market. All of the Smith & Wesson product lines are handcrafted in the USA, using the finest quality materials, with a lifetime warranty. Both the high security safes and the secure in-vehicle storage conform to the high standards delivered by any Smith & Wesson firearm. S&W QuickDraw is made of massive 16 gauge, cold rolled steel construction with a hinge assisted lid that presents your handgun to you when opened! S&W High Security Briefcase has welded tab and notch seams and features a high-security barrel lock with two keys. 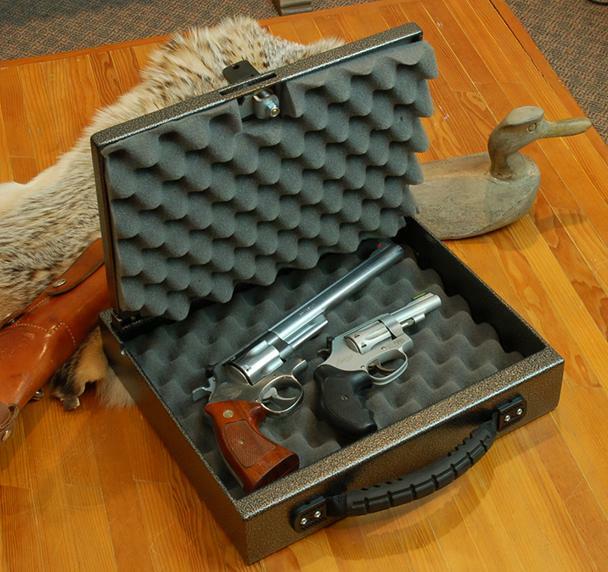 S&W TruckVault is the ultimate solution to secure your firearms and valuables in any make of truck, car or SUV.